(Nov. 29, 2016) Bright orange yard signs are blossoming on Portland streets. 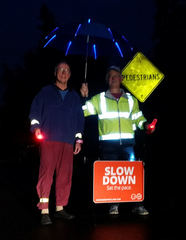 The signs, free to borrow from PBOT, reflect a shared desire for people to drive safely in Portland. “People are requesting these signs because they feel unsafe on their street,” says Donna Herron, interim chair of the SWNI Public Safety Committee, who has helped distribute at least 40 yard signs in the last year. Herron says the demand is a result of people “driving like crazy,” including texting, speeding and rolling through stop signs. 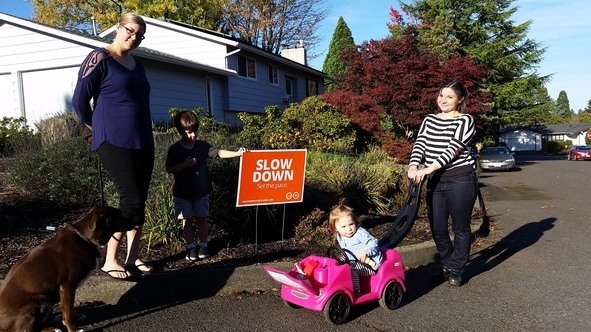 Neighbors in the Markham neighborhood pose with their new Vision Zero yard sign. Photo by Donna Herron, Markham Neighborhood Association. The yard signs are a small but highly visible part of Vision Zero, a citywide program that aims to eliminate traffic deaths and serious injuries by 2025. Along with education, Vision Zero focuses on changing street designs to prevent deaths and serious injuries. Vision Zero also uses enforcement and policy changes to support safety. In addition to requesting yard signs with safety messages, people can promote awareness of Vision Zero by requesting stickers, pins, brochures and fliers. Going forward, there will be additional opportunities to get involved. Markham Neighborhood has embraced Vision Zero with its "Paint the Neighborhood Orange" campaign. Photo by Donna Herron, Markham Neighborhood Association. The opportunities are described in the Education & Accountability section of the draft Vision Zero Action Plan, which Portland City Council will consider for adoption on December 1. People wanting Vision Zero materials can pick them up at the hearing. 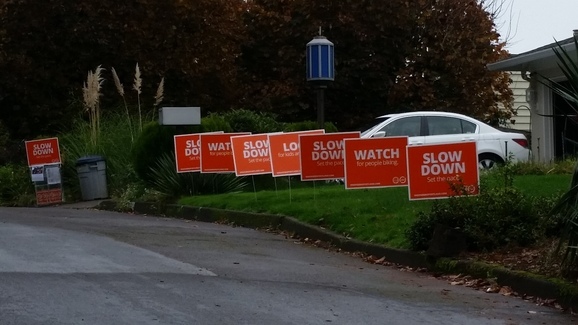 Markham Neighborhood has already embraced Vision Zero with its “Paint the Neighborhood Orange” campaign, which encourages residents to install the brightly colored PBOT yard signs on their property. PBOT loans a yard sign free-of-charge for every six people who sign a safety pledge. The Vision Zero Task Force has overseen the creation of a draft Vision Zero Action Plan with specific steps to make streets safe. This draft plan will go to Portland's City Council for approval on Thursday, December 1, at 3 p.m. The public hearing will include a short presentation followed by testimony from community members who helped create the plan through the Vision Zero Task Force. Others who would like to speak can sign up at City Hall starting at 1 p.m. on the day of the hearing. Each person receives three minutes to speak in the order in which they are on the list. Community members interested in Vision Zero can pick up stickers, signs, pins, brochures and other materials about the program while at the hearing. For questions about the hearing on Thursday, email Vision Zero.